Despite more than 15 years passing since the first description of video-assisted thoracoscopic surgery (VATS) for pulmonary resection, the technique has yet to gain widespread acceptance, especially in community hospitals. The majority of surgeons who routinely perform VATS resections work in academic or government institutions. The perceived complexity of the technique, inadequate instrumentation and resources, and concern regarding the potential compromise of surgical and oncologic principles may present a greater barrier to adoption of the conventional VATS technique by community-based surgeons. The objective of this study was to determine the outcomes of a hybrid technique for VATS pulmonary resection utilized by a single surgeon in a community-based practice. A series of 492 VATS pulmonary resections performed between January 2005 and March 2008 was retrospectively reviewed. All procedures were performed by a community-based, solo-practice surgeon using a hybrid VATS technique, with the routine utilization of a thoracoscopy port and a utility incision. The advantages of this dual access are ease in instrumentation, visualization, lighting, and retraction. In addition, this technique allows immediate access under direct vision for urgent control of bleeding, which can be difficult using a conventional thoracoscopic approach. There were 264 women (54%) and 225 men (46%), with a mean age of 62.8 years (range, 14-88). 166 patients (34%) had benign lesions, and 326 (66%) had malignant lesions. Lobectomy was performed in 242 patients (49%), segmentectomy in 127 (26%), wedge resection in 58 (12%), bleb resection in 45 (9%). Pneumonectomy was performed in 14 patients (3%) and bilobectomy in 3 patients (1%). The mean operative time was 52 minutes with a median of 48 minutes. There were no conversions to conventional thoracotomy. The mean length of stay was 7 days (median 4 days). The mean length of ICU stay was 1.7 days, with 85% of patients having no days spent in the ICU. Mean duration of time with a chest tube was 4 days. There were no intraoperative deaths, however, 17 patients (3.5%) died in the perioperative period (within 30 days of surgery). Overall survival was 91.2 % over a mean follow-up of 239 days. These results compare favorably with outcomes reported for the conventional VATS approach. This series shows that a hybrid VATS approach to pulmonary resection can achieve outcomes comparable to those of conventional VATS. To our knowledge, this is the largest reported series of VATS pulmonary resection from a community-based surgical practice. 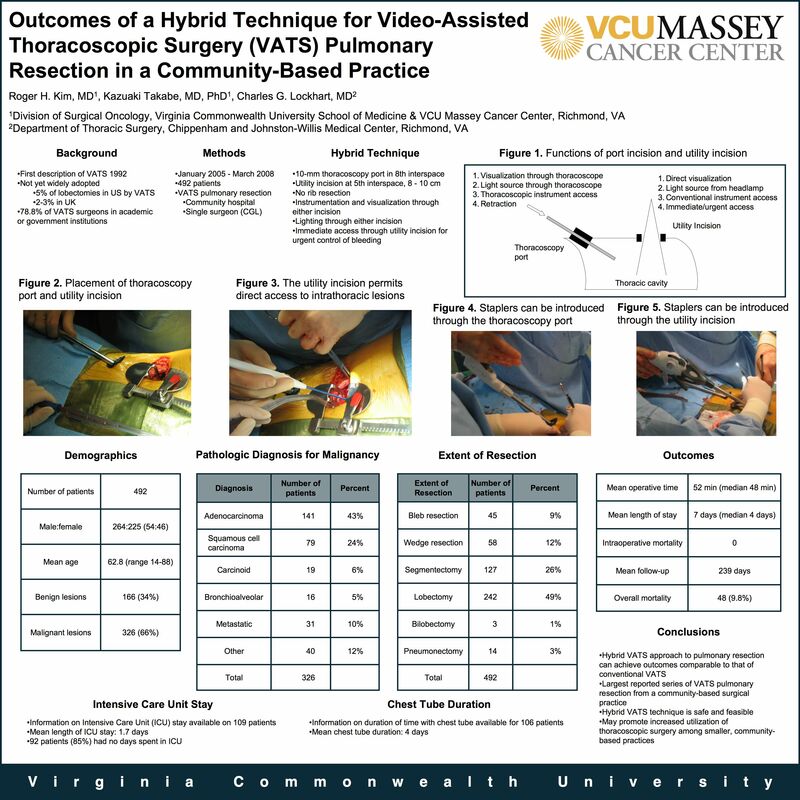 This hybrid VATS approach is safe and feasible and may promote an increased utilization of thoracoscopic surgery among smaller, community-based practices.